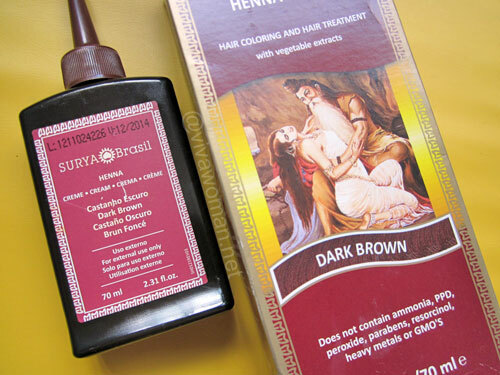 I wonder how many of you remember the “amorous” Surya Henna Cream I posted back in April? Heheh okay, it wasn’t an amorous cream but rather, the cream came packaged in a box with an amorous looking image. Well, I finally tried the product about three weeks ago and am ready to tell you if this henna cream worked for me. 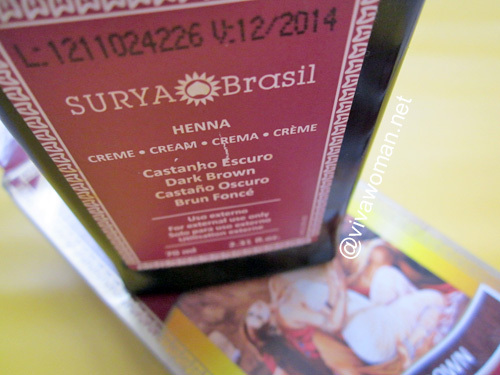 For those who missed my earlier preview, Surya Henna Cream hails from Brazil and is a semi permanent hair color said to not contain peroxide, ammonia, resorcinol, PPD, heavy metals or parabens. Instead the product uses both plant dyes and gentle hair dyes, including 15 high quality herbs and fruits to add conditioners to the hair. So this gentler and healthier cream will definitely appeal to many who are looking for a natural alternative to color their hair. I bought it from iHerb.com for less than US$10. It isn’t difficult to use this henna cream. Unlike other DIY hair dyes I’ve tried, this one requires me to wash my hair first. I then had to don my hands with disposable gloves to spread the cream on my hair instead of using a comb. 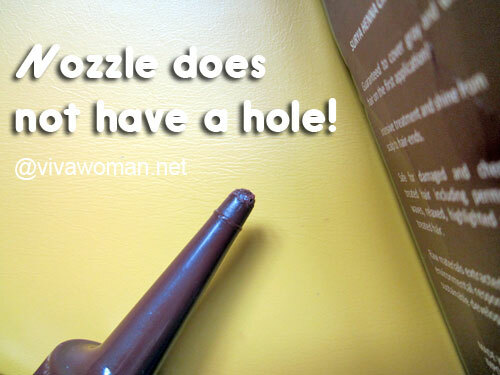 But strangely, the nozzle of the product I bought had no hole. I am not sure if it’s because the one I had was faulty but the problem was quickly resolved with a pair of scissors. The plus point about the Surya Henna Cream is that it does not leave any unpleasant ammonia scent so I didn’t smell like cat poo during my usage of this product nor after. There is a smell all right but it reminded me of chocolate! In addition, my hair felt exceptionally soft after using this cream and so it lives up to its promise of conditioning and moisturizing my hair. I didn’t even need to use hair conditioner afterwards. I also found it reversed the damage that the commercial hair dyes had done to my hair. The only gripe is that this leaves stains on my scalp but they were quickly washed away the day after when I started shampooing my hair. This henna cream comes with a detailed product explanation sheet and in it, you’ll find information on how long to use this product for different hair color and needs. I had to leave this on my hair for an hour because I needed to cover my grays. Unfortunately, even after an hour, I could still see a few gray strands after I’ve washed and dried my hair. Maybe the dark brown doesn’t cover so well but I’m pretty sure the effects of this henna cream isn’t long lasting. After three weeks now, I definitely need another application because many of my grays are now showing. But because the Surya Henna Cream contains gentler ingredients, it is said this product can be used quite frequently on our hair. However, I still prefer to space out the duration of usage – like three weeks or so if my grays can wait. 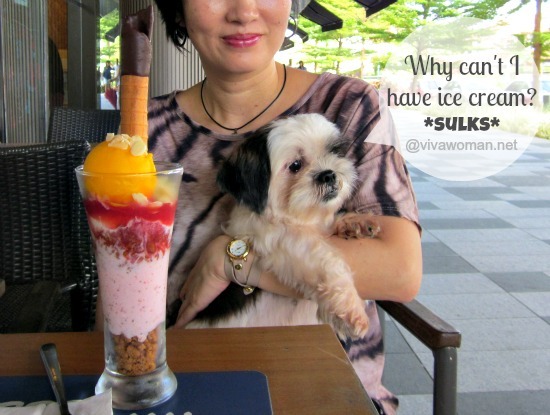 Surya Henna Cream: a story of temptation & love Share: are you more of a dog person or a cat lover? 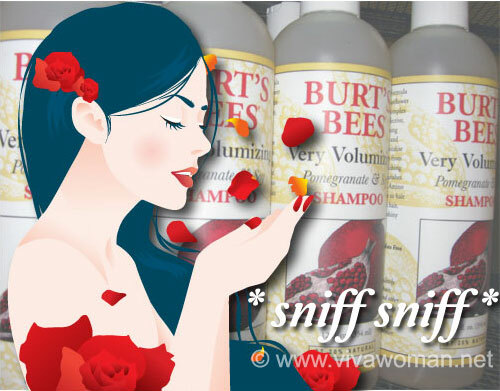 Professional hair color without the bad smell Share: must your beauty products smell good?